One of the major indigenous languages in Bangladesh is the Chakma language, which is an Indo-European language spoken by approx. 310,000 people in southeast Bangladesh and another 300,000 in India in the Eastern most parts of India. It is written using the Chakma script which is dying because many Chakmas do not have the opportunity to learn their language in schools. 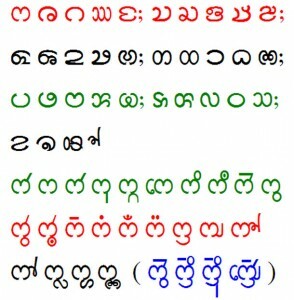 The authorities are trying to introduce Chakma language in the schools which is hampered by political reasons and a growing debate [bn] regarding standardization of scripts and fonts. But the Chakma people are using social media and web technologies to create awareness and spread their language. Chakma Scripts is an interactive website which includes discussion forum, tutorials on Chakma script and Language, e-book, videos etc. to spread the use of the language. The indigenous community is growing strong with their presence in blog, Facebook, Open dictionary, online news letters etc. The Chakmas are deprived of any radio or TV channel in their language, but Chakma language songs are regularly posted on YouTube which are catering them. It may be mentioned here that out of more than 30 indigenous languages in Bangladesh two have already died and another ten are facing extinction.